Traveling the highways of America at 31 miles per hour, the SolarWorld Gran Turismo arrived in Santa Barbara Friday afternoon. 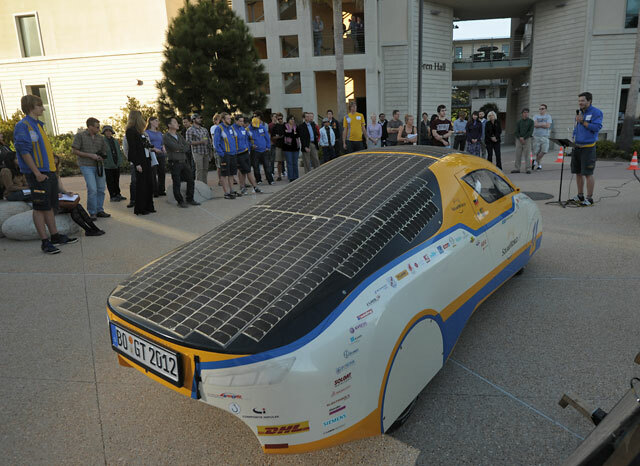 A team of 30 Bochum University students and SolarWorld collaborated to produce the two-seater sports car, powered by roof-integrated solar panels, in an effort to set the world record for the longest distance traveled by a solar-powered vehicle. “I have to say, normal solar cars are faster than ours, but we decided to create one that looked like a normal car,” said Philipp Liesen, a member of the Bochum University team. The car visited the Bren School at UCSB for a meet-and-greet, including a joyride around campus for a raffle-winner in the crowd. Santa Barbara was one of the Gran Turismo’s first stops in its U.S. tour. After the World Solar Challenge competition in Australia with 37 other solar-powered vehicles, the car went to New Zealand, and was then shipped to San Francisco. “We really can go very far with green, solar-powered, zero emission [vehicles]. Everything from cars to airplanes is within our grasp,” said Minnie Dimesa, Marketing Communications Manager at SolarWorld Americas, in a brief speech at the Bren School stop. The car is decked out with solar panels made of crystalline silicon. While 31 miles per hour is the GT’s most efficient speed, it can cruise at a maximum 70 mph, a rate the creators jokingly admitted to driving close to when trying to reach UCSB in time for the event. Without sunlight, the GT can run for about 240 miles. With sunlight, it can go as far as it wants. The record-breaking trip is anticipated to last until November of this year with stops in Los Angeles, Dallas, Charleston, and Miami. The GT will then move on to northern Africa, various locations in Europe and Asia and then back to Australia, racking up an expected total of 18,600 miles — a distance that would bust the Guinness World Record for the longest distance traveled by a solar-powered car.